Homemade sourdough bread takes a lot of time, but that's mostly waiting time. But when it's finally ready, oh my, that's DE-LI-CI-OUS! Worth every second. A sourdough bread takes a lot of time, but that’s mainly waiting time and therefore it’s not that much effort as it seems. We wanted to give it a try, during this months foodblogswap, cause we never made it before and we like new things. 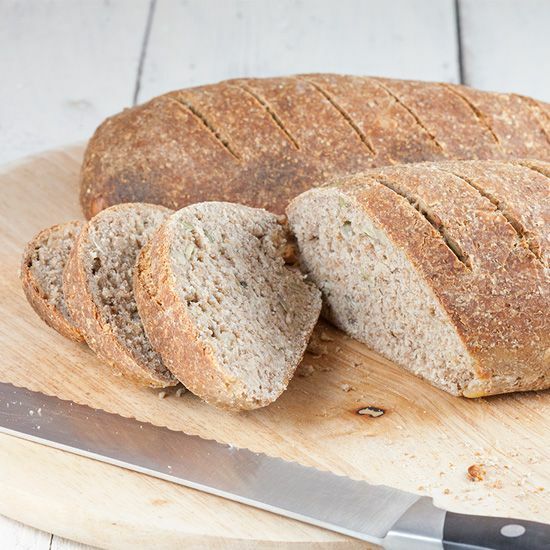 Our inspiration came from Severiens Kwizien, but we came across her English website and the sourdough bread popped up. We hope she doesn’t mind we skipped over to her second website, but we couldn’t find the sourdough bread on her Dutch website so we just had to! handful of assorted nuts, such as pine nuts, sunflower seeds, pumpkin seeds etc. Day 1: Combine 100 gram (light) rye flour and 100 ml lukewarm water, maybe you need to add a little bit of extra water until you’ve reached the consistency of a ‘Greek yogurt’. Cover with a clean damp kitchen towel and leave it in a draft free place at room temperature. Day 2 & 3: Check your starter and stir it a few times a day with a clean spoon. That’s very important for the bacteria. Day 4: Hopefully the process is going well, and your starter has some bubbles and it starts to smell kind of sour already. Now it’s time to feed the starter with an extra 100 gram flour and 50 ml water. Day 5: Feed again with another 100 gram of flour and 50 ml water. Leave again for at least 8 hours, or until you’ve got a lot of activity and bubbles in your starter. Day 6: Your sourdough starter should be ready by now, but sometimes it can take a little longer. If it’s ready, wait as long as possible and knead the dough in the evening. COMBINE flour, oatmeal and salt. ADD 300 grams of the sourdough starter and knead it well. ADD 250 ml water little by little and knead until you’ve reached an elastic dough. If the dough ball is too sticky, you need to add a little bit more flour. PLACE the doughball on an oven tray lined with parchment paper en cover with a damp kitchen towel again. Let it rise overnight. In the morning you’ll notice the dough has doubled in size. KNEAD it again until it’s elastic and shape them however you prefer. We liked it better to have 2 smaller breads instead of 1 big bread. COVER with the kitchen towel and let it rest another few hours and then PRE-HEAT your oven to 220 degrees celsius or 430 degrees fahrenheit. Use a sharp knife to cut them on the top how ever you like. You’ll notice on the pictures that the cuts need to be a bit deeper the next time. BAKE the breads for about 15 minutes on high heat for the crunchy crust. Lower the heat to 170 degrees celsius or 340 degrees fahrenheit and bake them for another 10 minutes. 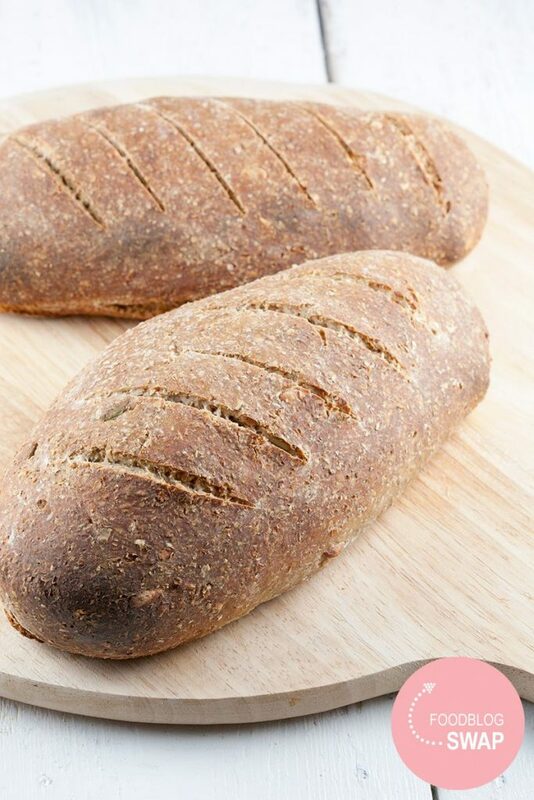 You can check if the breads are really done by tapping the bottom. The bread will sound hollow when it’s done. Enjoy! This is a great recipe – Sourdough does take a lot of time, but most of that time is hands-off, and it’s doing it’s own thing. 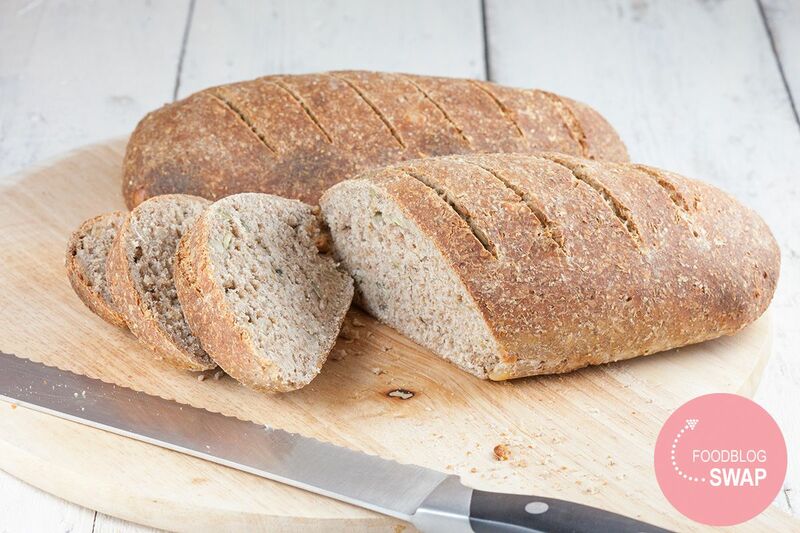 I haven’t been making it for about the last 6 months, but then I was using a no-knead method – so easy! But this looks really easy too – just the thing to get me back to my own sourdough! Thank you! Great looking bread and sourdough starter in only 6 days is amazing.